When you start your Ecwid business online, finding the right payment provider is usually the last thing you think about. However, it is very important to keep in mind that without one of these companies, you’ll never be able to accept online payments from your customers. Without them, it is impossible to sell online. A payment provider, also known as payment service provider (or PSP), is a business that partners up with banks in order to offer online merchants the possibility to send or receive payments online, from customers all around the globe. It is vital to consider your eCommerce payment provider before your Ecwid store goes live. You need to select the best method of accepting payments available in order to fit your needs and your customer’s needs. The payment gateway you select will also determine the features you will benefit from. The typical payment methods available today include cash, debit or credit card, checks, bank transfer, PayPal and other payment gateways. You need to use a diversified portfolio of payments in order to accommodate all your customers’ needs and to offer them a reliable purchasing experience. How Do I Receive Payments in Ecwid? The payment process may seem complicated, but here is a simple explanation. Basically, there are 4 main parties involved in any transaction online: the merchant (that’s you), the customers (the one buying your product), the acquiring bank and the issuing bank. The goal of every transaction is to transfer a certain amount of money from the issuing bank, which is the bank of the customer, to the acquiring bank, which is your bank, or the bank of the merchant. The payment gateway and the payment processor are there to connect these four parties. The payment processor is the entity that executes a transaction by ensuring all data is seamlessly transmitted between parties. Moreover, it gives you access to credit card processors in order to be able to accept credit card payments. On the other hand, the payment gateway is the entity that authorizes a transaction. The gateway acts like a guard, a middle-man, whose role is to secure the transaction and make sure the money reaches the destination without being stolen by cyber criminals. Learn how to setup Payment Gateways in my Ecwid eCommerce Power Course! 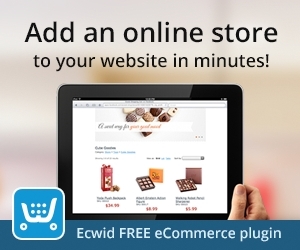 It takes you thought the whole process of building your Ecwid store and driving sales quickly. So how does the payment gateway do its job? It works similar to a physical credit card reader at a store. Once a customer decides to buy a product from you, the money is taken by the payment gateway and stored into a secure vault. Once the transaction is approved by both the issuing and the acquiring bank, the funds are released and are sent your way. You’ll see the money in your merchant account that is connected to your local bank account. To ensure that sensitive data is not stolen, the gateway offers SSL security and multiple layers of protection. Once you get the confirmation that money has been sent your way, you can begin the shipping process. Because Ecwid is keen on providing a secure environment where users can shop knowing that no one will steal their sensitive data, this platform only works with trusted payment gateways. All the gateways Ecwid accepts offer a high-level of encryption and data security, complying with all PCI standards. Most of them use SSL, or Secure Socket Layer, together with other high-end security precautions, to help your customers gain complete confidence during a transaction. Ecwid works with numerous payment providers, 55 of them to be exact. Here is the full list. Please note the list may evolve in the future. At this point, you might be wondering which payment provider is right for you. You need to take into account a couple aspects before choosing the right company to work with. First, you need to make sure that the payment provider you choose is easy to set up and offers instant approvals. It is very frustrating to see money in your payment provider account, but not be able to transfer it to your bank account. You will want to start using your account ASAP, especially if you are in a hurry launching your store. You also want to get access to your money as quickly as possible. Second, it is imperative to ensure that the payment provider accepts payment in your currency, and offers support in your region. For example, if you live in Russia, you might want to go with Yandex or WalletOne. If you reside in India, you should go with PayUMoney or PayUBiz. For Europe users, 2Checkout, PayPal, iPayment and SEPA work best. For Brazil, go with PagSeguro. The third aspect to look at when choosing a payment provider for your Ecwid store is the features of the tool. You want to work with a payment tool that meets all the needs of your business and offers you unique benefits. You also want to be sure this payment provider is recognized or will be easily adopted by your customers. Lastly, you want to ensure that the pricing plans cater to your budget, and the transaction fees offered will not make a hole in your wallet. Every gateway offers a unique fee structure, depending on their target audience. If a plan is more expensive it doesn’t necessarily mean that it brings you extra features you could use. Try to set a list with your top priorities and choose a payment provider based on your needs. For example, if you are looking for low transaction fees, international service or 24/7 customer service support, look for a payment provider that offers you those specific features. When considering which payment provider to choose for your Ecwid store, you need to look at certain features. The good news is that since Ecwid is keen on providing a secure eCommerce solution, they only work with platforms offering trusted payment gateways. But if you are looking for another gateway to integrate your store, make sure to choose the right one. Your choice will not only impact your cash flow, but also positively or negatively impact your customer experience. Try to select a payment gateway that has these features embedded. This extremely important feature is a complex security standard that belongs to the top 5 biggest credit card companies, namely Discover, American Express, Visa, MasterCard and JCB. This security standard protects card payments and keeps you safe from fines, data breaches, forensic audits or even investigations or allegations. You must work with a payment provider that is PCI DSS compliant. Some of the most advanced and useful fraud prevention features are CVV, AVS, large transaction flagging, 3D secure and risk scoring. You want to make sure your payment provider has as many of these features as possible. Lastly, you want the provider to allow you to accept other types of payments, in addition to credit or debit cards. You want to be able to accept Samsung Pay, Apple Pay or bitcoin for example. Accepting Ecwid payments involves using one of the above Ecwid payment gateways. In terms of accepting payments, remember that your customers desire flexibility above all else. Thus, you have to choose an eCommerce payment platform that integrates with a multitude of payment methods. The top 3 providers you could used to setup most stores are Paypal, Stripe and Square. As one of the most popular worldwide payment solution, PayPal enables you to send money, get paid and of course accept payments through any type of credit & debit card and bank account. PayPal offers top-notch security features and is highly versatile in terms of payment selection. To set up payment on your Ecwid store, simply go to your Ecwid Control Panel, then Payments and click “Enable PayPal”. If you already have a PayPal account registered on your name, you can start using it ASAP to receive payments from your eCommerce store. Get updated tutorials and learn more in my Ecwid eCommerce Power Course! Take your Ecwid store to the next level with setup guides and ways to drive traffic and increase sales. Stripe offers you a customizable payment method that allows both desktop and mobile users to pay with ease, in no time at all. At the moment, Stripe accepts over 100 currencies and allows you to customize the checkout process in order to promote your brand among new customers. To set up Stripe, go to your Dashboard – System – Payment Settings – Credit Cards – Change. Then add CreditCard: Stripe, click “Connect to Stripe” and you are good to go. Inside the Stripe Control Panel, you will be able to enable automatic transfers to your bank account. Square is a fully synchronized payment gateway that allows users to make a payment right on your site, without being redirected to an external page. This advanced payment method is currently only available in the US, Japan, Canada, Australia and UK. To learn how to integrate Square with your Ecwid store, check out this blog post by Ecwid. Does Ecwid Accept Bitcoin Payments? Yes Ecwid accepts bitcoin payments. Ecwid has just integrated a new payment processor, called Coin Payments. Using this payment gateway, you can accept bitcoins and other 40 type of crypto currencies. You can find out more about Coin Payments here You can also discover how to integrate this payment processor with your Ecwid eCommerce store here. Yes, you can accept recurring subscription payments in Ecwid. Powr.io allows you to do this easily. You can embed their recurring payment plugin to your Ecwid store in order to allow customers to pay you on a subscription basis. Powr.io recurring payment plugin works seamlessly on both desktop and mobile. It requires no coding and can be customized on your Ecwid store dashboard. You can find out more about this powerful plugin here. Ecwid allows you to accept offline payments from customers with methods like wire transfer or cash on delivery. This is great for brick and mortar stores. All offline orders are marked as “awaiting payment” in your store’s backend. Once the funds are collected, the orders will change their status to “paid”. Note that Ecwid charges no transaction fees for payments that have been carried out using an offline method. Choosing the right Ecwid payment provider for your needs might seem to be a daunting task. The good news is that Ecwid has chosen to integrate with 55 serious payment gateways to make your choice easier. Once your payment gateways are set, you’ll be able to scale up your business and take it to a whole new level. 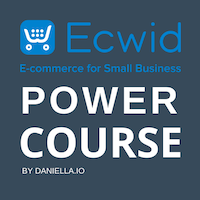 Get updated tutorials and learn more in my Ecwid eCommerce Power Course! 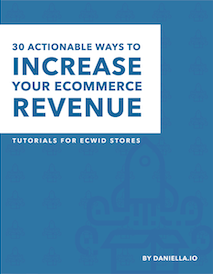 Take your Ecwid store to the next level with setup guides and ways to drive traffic and increase sales.